From the moment I started walking from the bus stop to the Hotel Duomo in Siena, Italy, I knew I was in love with this city. Walking along the vibrant Via Banchi di Sopra and Via di Città, past the Piazza del Campo, seeing so many people strolling the narrow, stone-paved streets, laughing, smiling, enjoying the brisk 40 degree afternoon, I knew I was right where I wanted to be after hours of traveling from Dubai, a city I really did not enjoy. 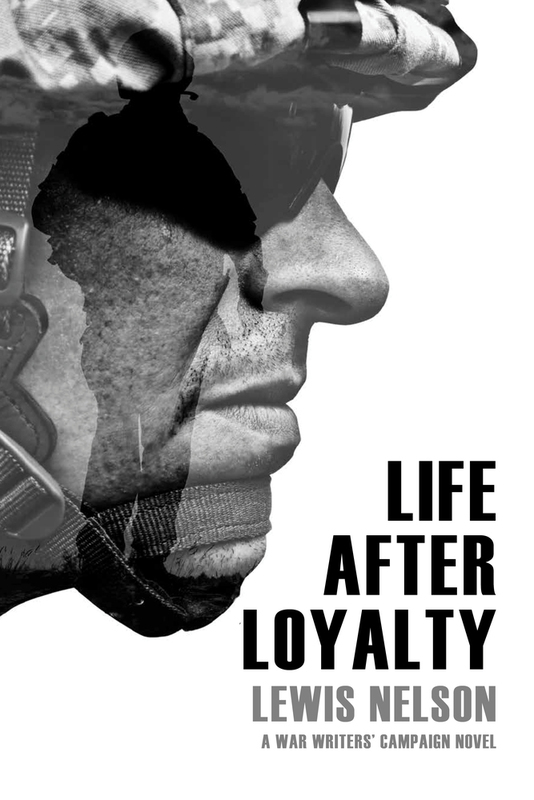 My stay in Siena was short, kind of an unexpected bonus trip after I realized I’d be departing Afghanistan almost four days earlier than planned. So on a whim, I booked a two-night stay and contacted a local guide to see as much of Siena and some of the wine country as possible in just 48 hours. Getting there from Florence: While most of Italy is best traveled by train, I had read both from Rick Steve’s guidebook and TripAdvisor that taking the rapide bus from Florence (just across the street, west of the train station) was the way to go. After I landed in Florence, I passed through customs in a breeze and took the shuttle bus straight to the train station for 8 Euros. I then arrived at the bus station about 5 minutes before a bus ordinario was departing for Siena. While this bus takes about 30 minutes longer and stops much more frequently, I knew I had a good 90 minutes of nap left in me after traveling all night and the next rapide bus was not for a few hours. Either bus cost 7,80 € and you can easily purchase the ticket right at the Florence SITA bus station; if you really want to plan ahead, take a glance at SITA’s Florence to Siena bus schedule (as of Nov 2013). 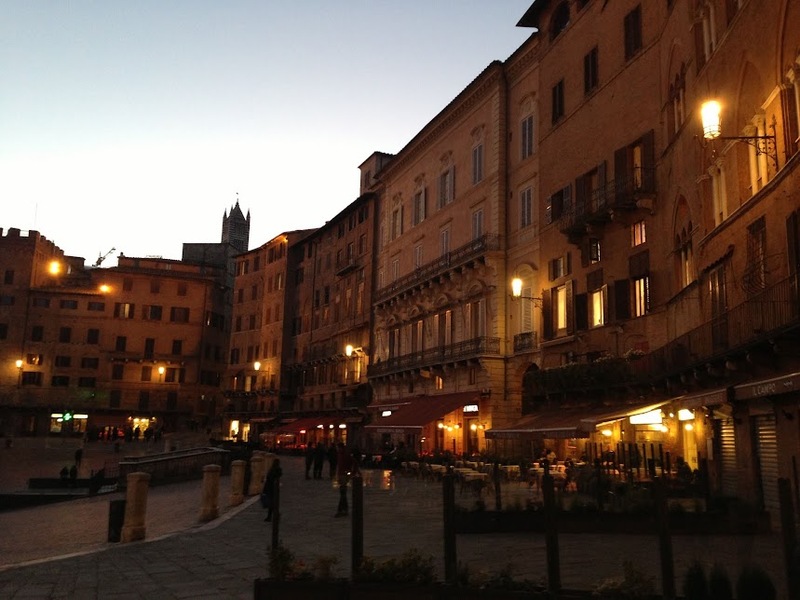 I woke up in a daze to everybody departing the bus so I assumed I had arrived in Siena. I didn’t really know how to get to my hotel from the bus station, but I could see the two towers of the Torre del Mangia and Siena Cathedral and just walked in that direction. I was in no hurry despite the 70-pound backpack I was forced to haul around (thanks to a laptop and a few other belongings I couldn’t mail home from Afghanistan). I walked down Via di Città past Piazza del Campo and miraculously ended up right at the steps of the Hotel Duomo (see my review of the hotel near the end of this post). For the rest of the afternoon and evening, I strolled just like the locals do. I had a gelato and espresso overlooking the piazza. I said hello to people and started conversations with anyone that spoke English. I met a beautiful girl from Stuttgart, Germany, studying Italian in Florence for six months and helped her take pictures of herself in the piazza. I met two former U.S. Marines and one of their girlfriends and we shot darts together and talked about Siena, Rome, and Florence while downing happy hour beers at The Dublin Arms. I had a pizza margherita while people watching on the piazza. I walked to Piazza del Duomo and admired the beautiful fascade and architecture of the cathedral. I walked small city roads and admired homes painted in Tuscan yellow with green shutters. And when it got dark, I enjoyed a glass of Chianti Classico and warm bowl of soup before heading back to my room at 10pm. I knew very little about Siena ten days ago. In 1999 I traveled with 30 other Minnesota private college students for 21 days in Italy, France, and England. We did the whirlwind tours of Milan, Venice, Padua, Florence, Pisa, and Rome. While trying to figure out new adventures, I saw Siena just sitting there south of Florence with this amazing piazza and easy access to Tuscany’s wine country. That was all I needed to convince me I wanted to start my travels here. Not knowing anything, I read every page of Rick Steve’s guidebook on Siena and spent a few hours on TravelAdvisor. I also knew I wanted to pay a visit to Castello d’Albola in Radda in Chianti, a vineyard with the same owners as Barboursville Vineyard near my hometown of Charlottesville, VA. To simplify matters, I decided to hire a local guide, Costanza Riccardi of Siena Walking Tours (see review at the end of this post). I enjoyed a small breakfast provided at Hotel Duomo (croissant with Nutella and a double-shot espresso) then met Costanza in front of the hotel at 9:30am. Over the next 3 ½ hours, Costanza educated me on Siena’s contrade, palaces, history, architecture, artists, and twice-annual Il Palio di Siena horse race where each of Siena’s 17 contrade race for pride against their neighboring rivals. The entire morning felt like I was visiting a long-time friend who was enthusiastically showing me her hometown – albeit with much more knowledge than the average citizen. We walked throughout the old city, toured the Piazza del Duomo and Siena Cathedral, talked about the life of the Sienese, and discussed not only Siena’s long and storied history, but also current events and local personalities. She showed me the interior plazas of palace compounds and explained their significance as way the wealthy could provide a safe haven for their families. She explained the city’s many frescos and the Sienese reverence of the Virgin Mary and St. Catherine of Siena. She scored me a free sample of Siena’s two most famous pastries: panforte and ricciarelli at Il Magnifico (see review at the end of this post). We talked about current real estate and small business dilemmas on the same block as a discussion on the Black Plague and how it changed Siena. We talked rivalries, both between the city’s many neighborhood districts (contrade) and with their chief rival, Florence. Then for lunch, with my only requirement being a place with true, native Sienese dishes, we shared an amazing meal at Compagnia dei Vinattieri (see review at the end of this post) complete with a glass of Chianti Classico DOCG. During lunch, we talked about our children, travel, and raising a family in Siena. 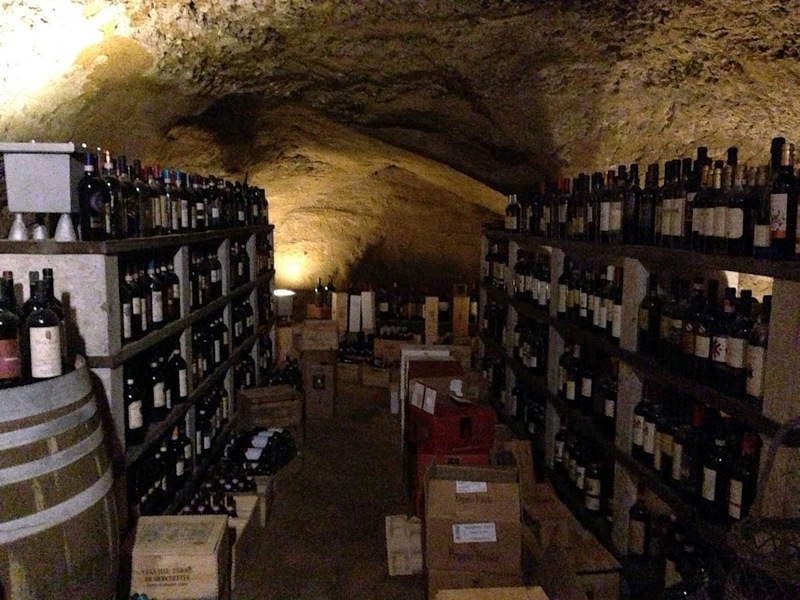 She also gave me my first lesson on Tuscan wine and cheese, which include a quick tour of the restaurant’s underground wine cellar. We concluded our walking tour with a quick visit to the St. Domenico Catherine Basilica before meeting our driver, Fernando, to head to the hills of Tuscan wine country. Chianti Classico seal is a black rooster (Gallo Nero in Italian) on gold. Legend has it that in 13th century Florence and Siena decided to dispute a funny horse race to end their fights for Chianti. The meeting point of two knights, who had left respectively from Florence and from Siena when the rooster sang at dawn, would be the border of their territories. Florentines got a black rooster and kept it for a few days in a box with no food. On the race day when they took the rooster out of the box he sang much earlier than dawn and the Florentine knight left before the Sienese one and met him only 20 km from Siena walls. Since then the black rooster has been the symbol of Chianti: first of the Chianti League in 13th century and then of the Chianti Classico Consortium. We arrived at the Zonin Family’s Castello d’Albola (see review at the end of this post) around 3pm and met with their hospitality director Paola. It’s definitely off-season in Tuscany; the grapes and olives are all removed from their host vines and trees and there were definitely no crowds. In fact, we were the only visitors. Once again, I benefited from more personal attention! We spent the next hour touring the grounds, visiting the cellars, seeing the aging barrels, and sampling many of the wineries creations. I’ve been to many tasting rooms in Virginia and northern California, but never have I enjoyed every single wine put in front of me. I can no longer say that. I tried five separate Castello d’Albola bottles (Chianti Classico, Chianti Classico Riserva, Le Ellere, Vin Santo del Chianti Classico, and Grappa del Chianti Classico) and loved them all. I went away with two bottles and freshly pressed olive oil. 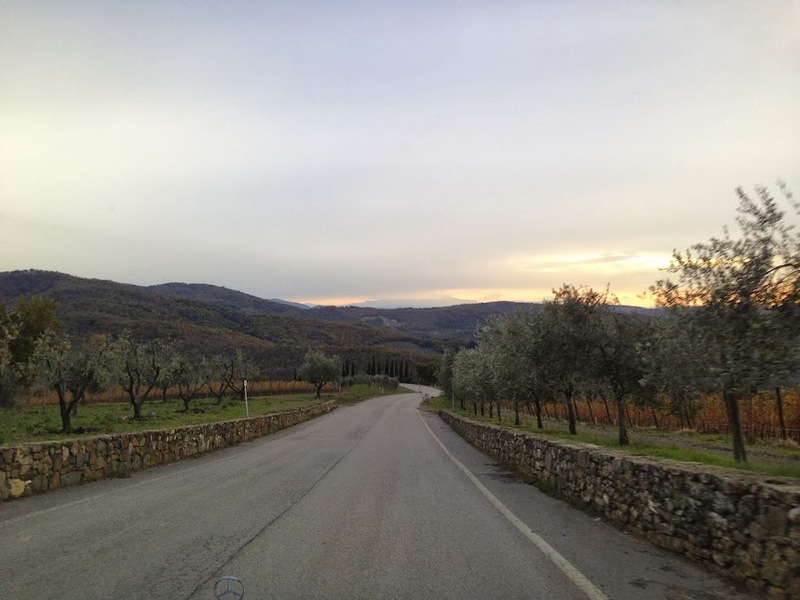 On the ride back to Siena, we took a different route where Constanza took me on quick walking tours of Radda in Chianti and Castellina in Chianti. Both villages were definitely sleepy in this cold off-season, but I’m already envisioning a spring or fall return trip to fully experience these beautiful towns with their attractive cafes and beautiful overlooks. The approach to Castellina in particular was truly amazing as the town’s spires peaked the top of the hillside with the setting sun just behind them. Pictures could not do this scene justice so I didn’t even try; nor did I want to miss a moment of just seeing it for myself. 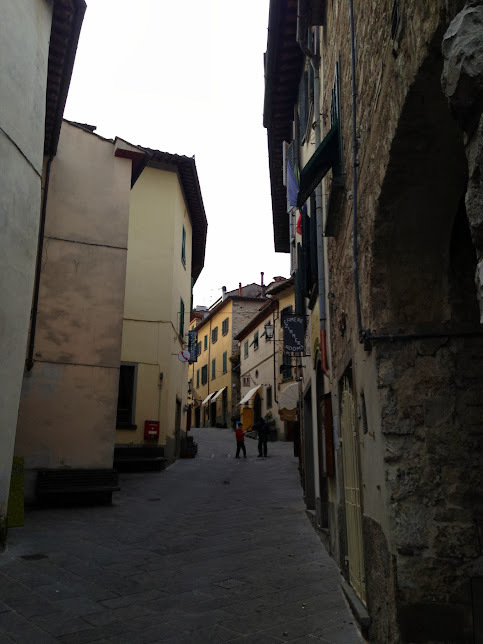 Costanza explained the medieval passageways in each village, and we even walked through Radda in Chianti’s short medieval walkway now lined with wine bars and other shops. We topped the visit off with some famous gelato at Gelateria l’Antica Delizia in Castellina in Chianti. Not only was the gelato delicious, but the shop keeper gave us the entire history of gelato with a passion one rarely finds in an ice cream parlor. I spent about an hour recovering in my room before heading out for a final Siena dinner. Costanza recommended a nearby restaurant, but I arrived a bit too late and they were not taking new patrons at the time. I instead made my way back to the piazza to enjoy a final meal under the outdoor heat lamps and tables overlooking the Palazzo Pubblico. The outdoor patio quickly filled with young Italian couples and friends sipping wine and enjoying the chilly Wednesday night in one of Italy’s most beautiful cities. I have no great stories to tell you about my final morning in Siena. I sat in front of my open window at the Hotel Duomo admiring the view of the city while reviewing the iPhone pictures I took the day before. I just enjoyed being in the presence of this amazing city. I enjoyed a final, free breakfast, packed up my goods, and hopped in a taxi to the train station. Siena’s train station is not conveniently located near the old city, which is possibly the only negative thing I can say about Siena. In order to take a train to Rome, most routes also force you to return to Florence, as Siena is on a local rail-line and not the high speed Trentalia Frecciargento line. But I have no real time table and this train ride has given me the time to write this long and extensive blog posting! So I’m now en route to Rome for more adventures. If you’re looking for a fairly inexpensive hotel close to the action, the Hotel Duomo is a step-up from a hostel at only a fraction of the cost more than a hostel private room (less than 60 Euro a night for my off-season, lone traveler stay). The hotel is on the same road as most of Siena’s shops and restaurants bordering the Piazza del Campo, and obviously just minutes away from the Siena Cathedral (Duomo). The lobby is small, but both employees I met at the desk spoke great English and were very friendly. There is not an over-abundance of tourist literature, just some random brochures, or any tour guide sales pitches. There is a desktop computer right in the small lobby, but I did not see a printer and I did not try to use it. The hotel offers free WiFi which was fast enough to FaceTime home to my kids and easy to connect (you have to ask the front desk for a 24-hour username and password, but it’s included in your stay). There is also a small breakfast of croissants, crackers, yogurt, cereals, jelly, cheese, meats, and fruit. They also offer espresso and coffee drinks. From the lobby, there is a tiny elevator that takes you to a small sitting area and the second floor rooms (the stairs from the lobby to second floor are for emergency use only). From the second floor, there is another staircase that leads to four third floor rooms and small balcony. I would imagine the small balcony would be a wonderful spot to enjoy a short break from the city on a warmer day, but at 30 and 40-degree Fahrenheit temps, I didn’t find a good reason to sit there. My room was just opposite the balcony, a small single room with a twin bed, small desk, large wardrobe, and a window facing the old city. The bed was firm. The bathroom was modern and clean with a heated towel rack and walk in shower. There was only one spare electric outlet (2 or 3 prong in-line 220v European outlet) at the foot of the bed, but there were two lamps plugged in between the bed and desk (so you can unplug one if you need another outlet). If I want to be nit-picky, there are only things a few things I can complain about. The walls are pretty thin; there was a child in the room next door and their bathroom was just on the other side of the wall from the bed so I heard plenty of chatter, water running, and slamming doors. The towels had a funny smell to them. And that’s about it. It was 55 Euro a night; I wasn’t expecting the Ritz. I’ve already given many details on how much I learned from Costanza during our full day together. I highly recommend reading my full Day 2 story above. But to give a short and sweet review see the next paragraph. I have nothing but great things to say about Siena Walking Tours, led by Costanza Riccardi. 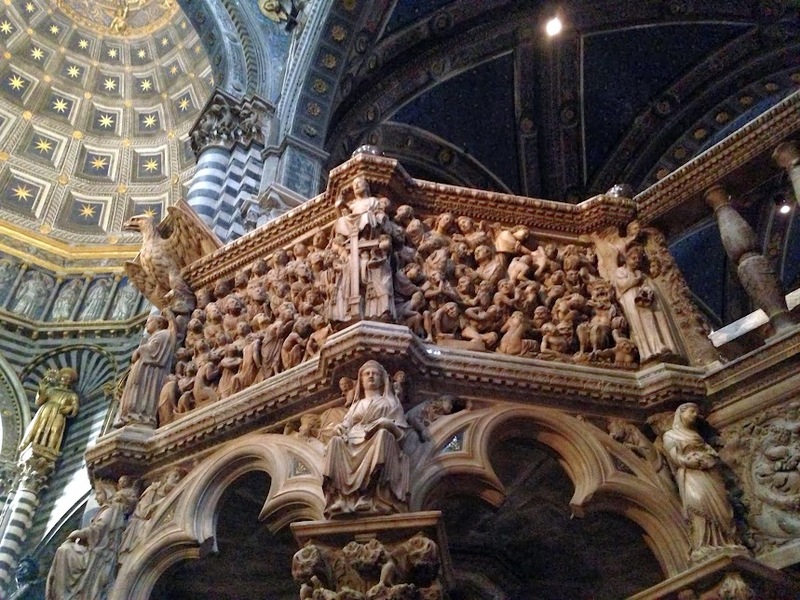 With only a week notice and very little input from me, Costanza led me on a wonderful, history-filled half-day tour of Siena offering cultural, artistic, architectural, and historical expertise with a personal touch. She made most of our route decisions, but gladly followed any nudging or tangents on my part. Our email communication before the trip was both prompt and detailed, and she even arranged a private driver to get me to a specific vineyard I had requested. As the day progressed, I felt more and more like I was visiting a personal friend in her hometown. Costanza’s English is wonderful, she’s passionate about Siena, she has a great sense of humor, and is a great conversationalist. Constanza also helped arrange for a driver and led me on a tour to Castello d’Albola vineyard, Radda in Chianti, and Castellina in Chianti. I can’t imagine I could have been any happier with a personal guide to Siena and Chianti. With my only conditions being a nearby restaurant with authentic Sienese fare, Costanza of Siena Walking Tours brought me to Compagnia dei Vinattieri. The atmosphere is very much what I had hoped for with an old city feel, but very clean and formal. I enjoyed a Sienese ravioli with pesto dish, local formaggio (cheese) plate, and a glass of Chianti Classico. Our waitress was very friendly, spoke great English, and graciously showed us the restaurant’s underground wine cellar (one of the highlights of my lunch visit). Our lunch for two with wine and side dishes was about 50 Euros. I’d highly recommend this restaurant for couples, lone travelers, or small groups of friends. I will also definitely be returning here if I come back to Siena. Castello d’Albola is located atop a long and winding road near Radda in Chianti. Owned by the Zonin family, who also owns Barboursville Vineyard near my hometown of Charlottesville, VA, I had high expectations for the wine and they did not disappoint. The grounds are beautiful, even during my off-season visit. The hospitality director Paola was wonderful. I contacted her in advance and my Siena Walking Tour guide Constanza confirmed the details of our visit ahead of time. We met, had a tour of the grounds, wine cellar, aging rooms, and group tasting room before sampling five of the vineyard’s creations. I can rarely say I like every wine I taste at an individual vineyard, but I would definitely purchase and enjoy all of the wines I tasted at Castello d’Albola. 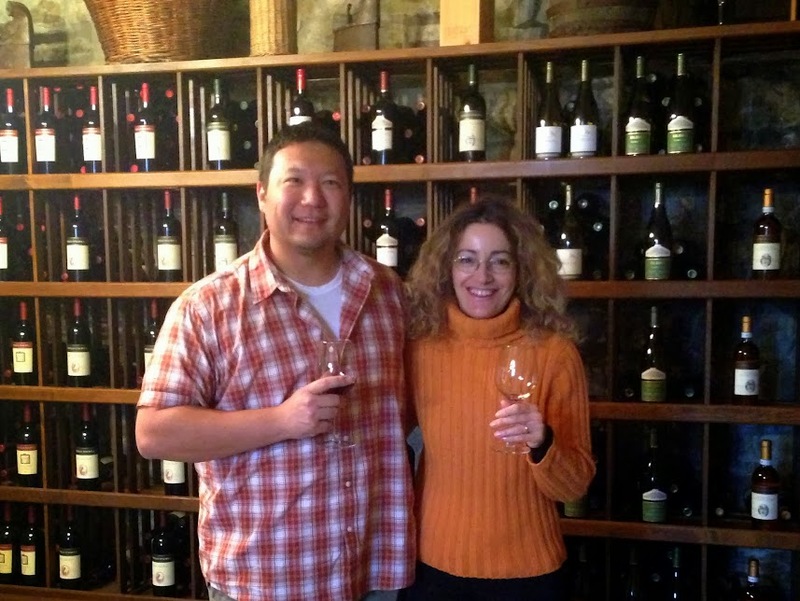 I highly recommend both their wines and a visit to their vineyard. If you plan to go, combine it with a day trip to Radda in Chianti. Tastings are free and Paola speaks great English. 60 to 90 minutes is sufficient for the visit. I also purchased some olive oil pressed on the grounds, but I haven’t had the chance to taste it yet to review. I have a feeling it will be delicious. My Siena Walking Tour guide Costanza brought me to this small, local bakery to try two famous Siena goods: panforte and ricciarelli. In the front window of the bakery is a book showing the owner lying on loaves of bread, delicately hugging a loaf, which just clearly shows how passionate he is about baking. The staff was so friendly and offered free samples of both the panforte and both types of ricciarelli. They also sold a variety of other baked goods, including pizza, that I didn’t try. I admired the store’s authenticity and if a life-long Siena native tells me this is the place to go, who am I to say otherwise!? my city 🙂 :)!! Viva Toscana! Great review!!! 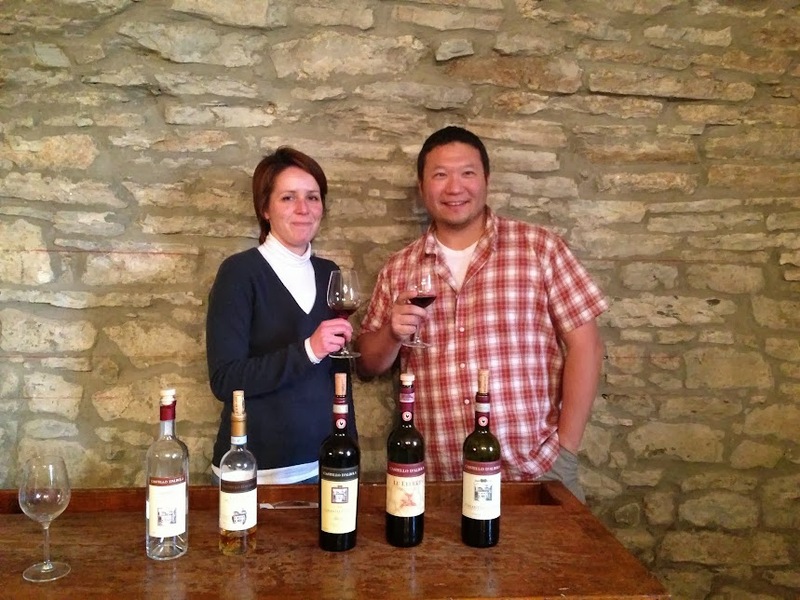 Last year I had Constanza for a tour in beautiful Tuscany. She is amazing and you describ her just right. Thank you. I use Rick Stevens guide books for all my trips and wish he will know her. I visit Tuscany every year except for this one, and your review really made miss it even more. It’s the most beautiful city I ever visited.